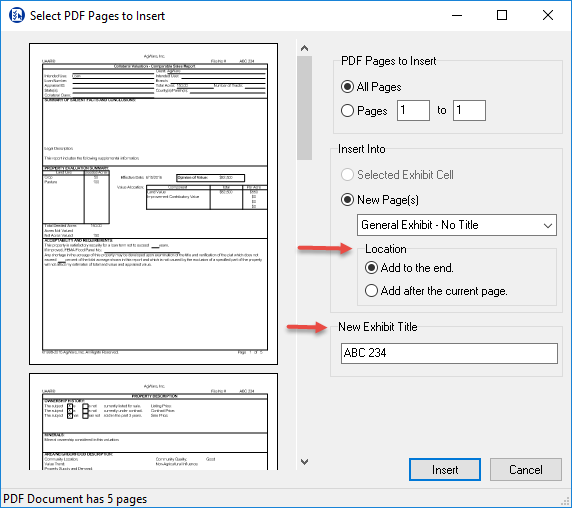 New options when inserting a PDF file. Added new additional page options. Page titles will be automatically set. By default only the first page will be included in the table of contents. The file can be inserted after the current page in the report instead of at the end. Link extra comment pages with the Pasted Sale Sheets. Extra comment pages will not automatically move with their main sale sheets. Photo pages will still be separate. Note: This means you cannot delete the extra comment pages. If the comments are too long and you wish to shorten them you need to either make the changes in the DataLog or import the sales using a “D” or “I” number. File No # has changed in the page headers to just “File #”. Pins on the Insert Sale map can now be moved. If pins need to be adjusted to make the map easier to read you can now adjust them directly on the map. The FAMC Income page can now import directly from the Sales database like other approach pages. Automatically close windows that were open at startup but not modified. USPAP ’06 form will now correctly import the Date of Report. Multiple fixes with how sections work. Fixed a bug that caused data to be cleared in section two when opening a report with multiple sections. On the Condensed Summary forms add missing “of” in page numbers. Add Response Ids for the Condensed Summary improvement table. On the Cover forms, change the width of centered fields to 90% of the page to accommodate longer names. Added a “Print Selected Sales” option under the Report menu. If you have more than one selected this report will print all of the selected sales using the current view. This will allow users to either print or create a PDF of multiple sales at once. The “Calculate Physical Depreciation” option will now work again. Improvements were made to the selection of sales in the grid. Error when deleting a single polygon from a map was fixed. Fixed a zoom issue that prevented the Yield Rate from being fully visible when running at a high DPI. Make the “Sale View” list longer so that users do not need to scroll to see custom templates.